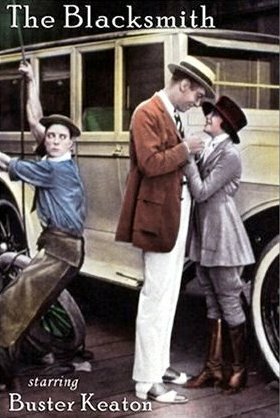 The Blacksmith is a 1922 American short comedy film co-written, co-directed by and featuring Buster Keaton. Buster plays an assistant blacksmith to the big worker played by Joe Roberts, with predictable results. The Blacksmith - Buster clowns around in a blacksmith's shop until he and the smithy get in a fight which sends the smithy to jail. Buster helps several customers with horses, then destroys a Rolls Royce while fixing the car parked next to it.